Question: How many hours in the last year have you invested into learning Excel? Are you where you want to be? As a coach, what if you could learn what you need to know in a few hours instead of a few months? Join the ETD Membership and get exclusive access! Learn EVERYTHING you need to know about creating an advanced strength and conditioning excel template! Tired of spending countless hours google searching excel formulas to figure out how to make things work? Let me show you how in just a few hours. Only members will gain access to complete training courses, free templates and so much more. With over 2 hours of video and downloadable guides for every step of the way, you are guaranteed to learn Excel! As part of your ETD Membership, you get access to members only templates. These templates are not available to the general public! Upon successful completion of the course, you will receive .5 CEU’s from the NSCA! Have you been looking at one of our templates? Sign up for this course first, then take an automatic 30% off the price of ANY excel template in store! Get books and seminar access through our membership cheaper than anywhere else on the web! Join nearly 100 other coaches in our Members Only Facebook group, where we discuss template designs, options, and get early notice of new features! What are strength coaches saying? Over 200 Coaches have done this course. Here is what a few have said.. The Excel Training Designs Course, on how to build a strength and conditioning template has been monumental in our business' development. Not only are we more equipped to handle the daily challenges associated with programming, but our staff has become more proficient in writing workout programs. Thank you very much for all that you do! Excel Training Designs is a must have for any serious physical preparation coach! I am profoundly grateful for Steve's efforts and his willingness to share such valuable information. Steve is always on standby waiting to help answer any questions. Not to mention, he's spent time in the trenches and is already familiar with many different training methodologies. Not only has Elite Training Designs help me enhance my skills with Excel, it has rejuvenated my passion for programming. Do not hesitate to take advantage of such a important product for your professional development. You will not regret it. Being productive and professional is nothing to a strength coach if you can’t also be effective. Excel Training Designs helps you become all three – it’s that good! Save time whilst delivering high quality branded templates to your athletes and clients. With excellent step by step tutorials, the ‘Create a Strength & Conditioning Template Course’ offered by Steve Olson at Excel Training Designs will guide you through the process in a logical easy to understand way. The templates pay for themselves from the very first use. So why wouldn’t you use them…? No brainer right!? I highly recommended Steve at Excel Training Designs and you will too. The ETD "Create a Strength & Conditioning Template Course" was designed for coaches who are spending too much time creating programs, googling formulas, and just overall want to better improve the quality of their training programs. We will show you everything you need to know, step by step, to start from a completely blank spreadsheet and turn it into a fully functional and automated training program designer. From learning the basics of merging cells and making borders, to using VBA to create a simple batch print and save as PDF, we have something to help everyone. Question: If you could save HUNDREDS of hours a year, would that help you? Every time you make a program, you could be doing it faster, better and more efficiently. 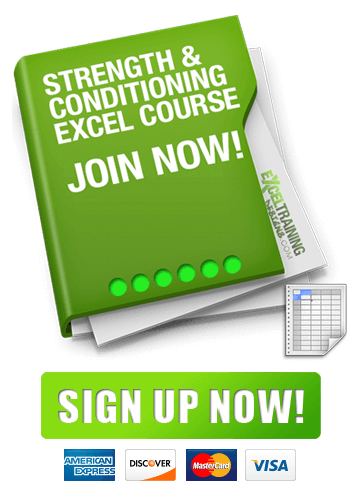 Earn .5 CEU's for creating your own Strength & Conditioning Excel Template! I am pretty good with excel, and have made several templates before. Is this for me? New videos and free templates are added roughly every month! We want to make sure to introduce new and useful ways for you to upgrade your template with features that will help you cut down on clutter and monotonous work, while increasing your ability to write better programs in less time. I am not good with Excel. Is this for me? Absolutely. If you have struggled with excel in the past, or simply never used it, this course will walk you through every single step needed to take an entirely blank excel spreadsheet and turn it into an advanced strength & conditioning excel template. Also, if at any point you get stuck, you can contact us for further help! How long does it take to get the CEU's? Immediately upon completing the course, you can use the Submit Template for CEU's contact form to send us your template. We will mail you your certificate of completion and CEU Form! Do I get Instant Access to Everything? Yes! Immediately upon registration you will have full access to every part of the ETD Membership: The course, the free templates, the facebook group (pending approval), and the discount! What is in the difference between the ETD Membership and "Create a Template" Course? They are essentially the same things! When you sign up for the ETD Membership, you get full access to the create a template course, however that is just one of the benefits. You also get full access to the additional training modules, free templates, members facebook group, and ability to submit your template for CEU's! Don't wait, become one of the 200+ coaches that have used this to further their Excel and programming skills.